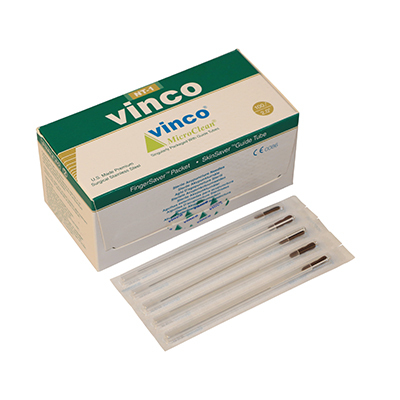 Vinco NT1 Blister Pack acupuncture needles are designed for maximum patient comfort. The lifted needle surface allows for easy insertion. The SkinSaver guide tube allows for more precise needle insertion. Blister Pack needles are individually packaged with color-coded tabs for easy identification. The SEIRIN® J-Type acupuncture needle produces gentle, painless, and stress-free treatments. Made from the highest quality stainless steel, it features a lightweight, comfort grip, 0.12 x 30 mm plastic handle that is color-coded for easy gauge identification. With Light Touch Insertion, the needle is easily released from its guide tube by gently pressing the needle away from its point of attachment on the tube. Each needle comes individually packaged with its own polypropylene guide tube, which is rounded on the end for patient comfort and is 100% PVC-free. Box of 100 sterile, green tipped disposable needles. 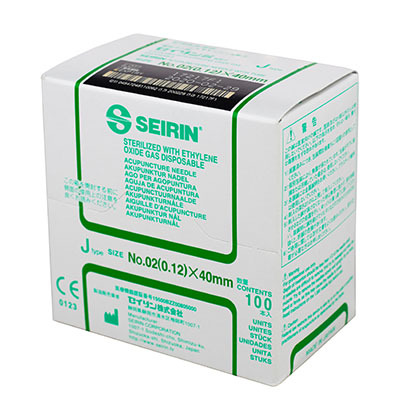 Dimensions: 3.25" x 3" x 2"
The SEIRIN® J-Type acupuncture needle produces gentle, painless, and stress-free treatments. Made from the highest quality stainless steel, it features a lightweight, comfort grip, 0.12 x 40 mm plastic handle that is color-coded for easy gauge identification. With Light Touch Insertion, the needle is easily released from its guide tube by gently pressing the needle away from its point of attachment on the tube. Each needle comes individually packaged with its own polypropylene guide tube, which is rounded on the end for patient comfort and is 100% PVC-free. Box of 100 sterile, green tipped disposable needles. Dimensions: 3.25" x 3.5" x 2"
The SEIRIN® J-Type acupuncture needle produces gentle, painless, and stress-free treatments. Made from the highest quality stainless steel, it features a lightweight, comfort grip, 0.14 x 30 mm plastic handle that is color-coded for easy gauge identification. With Light Touch Insertion, the needle is easily released from its guide tube by gently pressing the needle away from its point of attachment on the tube. Each needle comes individually packaged with its own polypropylene guide tube, which is rounded on the end for patient comfort and is 100% PVC-free. Box of 100 sterile, light green tipped disposable needles. 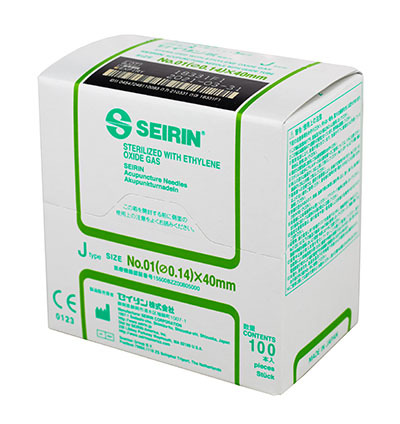 The SEIRIN® J-Type acupuncture needle produces gentle, painless, and stress-free treatments. Made from the highest quality stainless steel, it features a lightweight, comfort grip, 0.14 x 40 mm plastic handle that is color-coded for easy gauge identification. With Light Touch Insertion, the needle is easily released from its guide tube by gently pressing the needle away from its point of attachment on the tube. Each needle comes individually packaged with its own polypropylene guide tube, which is rounded on the end for patient comfort and is 100% PVC-free. Box of 100 sterile, light green tipped disposable needles. Dimensions: 3.25" x 3.25" x 2"
The SEIRIN® J-Type acupuncture needle produces gentle, painless, and stress-free treatments. Made from the highest quality stainless steel, it features a lightweight, comfort grip, 0.16 x 30 mm plastic handle that is color-coded for easy gauge identification. With Light Touch Insertion, the needle is easily released from its guide tube by gently pressing the needle away from its point of attachment on the tube. Each needle comes individually packaged with its own polypropylene guide tube, which is rounded on the end for patient comfort and is 100% PVC-free. Box of 100 sterile, red tipped disposable needles. The SEIRIN® J-Type acupuncture needle produces gentle, painless, and stress-free treatments. Made from the highest quality stainless steel, it features a lightweight, comfort grip, 0.16 x 40 mm plastic handle that is color-coded for easy gauge identification. With Light Touch Insertion, the needle is easily released from its guide tube by gently pressing the needle away from its point of attachment on the tube. Each needle comes individually packaged with its own polypropylene guide tube, which is rounded on the end for patient comfort and is 100% PVC-free. Box of 100 sterile, red tipped disposable needles. The SEIRIN® J-Type acupuncture needle produces gentle, painless, and stress-free treatments. Made from the highest quality stainless steel, it features a lightweight, comfort grip, 0.18 x 30 mm plastic handle that is color-coded for easy gauge identification. With Light Touch Insertion, the needle is easily released from its guide tube by gently pressing the needle away from its point of attachment on the tube. Each needle comes individually packaged with its own polypropylene guide tube, which is rounded on the end for patient comfort and is 100% PVC-free. Box of 100 sterile, orange tipped disposable needles. The SEIRIN® J-Type acupuncture needle produces gentle, painless, and stress-free treatments. Made from the highest quality stainless steel, it features a lightweight, comfort grip, 0.18 x 40 mm plastic handle that is color-coded for easy gauge identification. With Light Touch Insertion, the needle is easily released from its guide tube by gently pressing the needle away from its point of attachment on the tube. Each needle comes individually packaged with its own polypropylene guide tube, which is rounded on the end for patient comfort and is 100% PVC-free. Box of 100 sterile, orange tipped disposable needles. 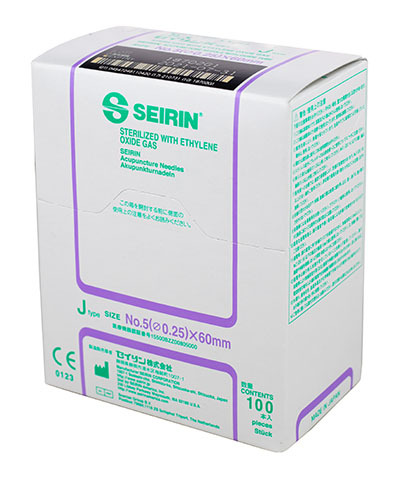 The SEIRIN® J-Type acupuncture needle produces gentle, painless, and stress-free treatments. Made from the highest quality stainless steel, it features a lightweight, comfort grip, 0.20 x 30 mm plastic handle that is color-coded for easy gauge identification. With Light Touch Insertion, the needle is easily released from its guide tube by gently pressing the needle away from its point of attachment on the tube. Each needle comes individually packaged with its own polypropylene guide tube, which is rounded on the end for patient comfort and is 100% PVC-free. Box of 100 sterile, light blue tipped disposable needles. The SEIRIN® J-Type acupuncture needle produces gentle, painless, and stress-free treatments. Made from the highest quality stainless steel, it features a lightweight, comfort grip, 0.20 x 40 mm plastic handle that is color-coded for easy gauge identification. With Light Touch Insertion, the needle is easily released from its guide tube by gently pressing the needle away from its point of attachment on the tube. Each needle comes individually packaged with its own polypropylene guide tube, which is rounded on the end for patient comfort and is 100% PVC-free. Box of 100 sterile, light blue tipped disposable needles. 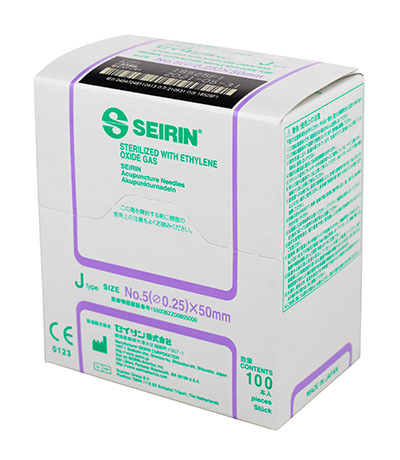 The SEIRIN® J-Type acupuncture needle produces gentle, painless, and stress-free treatments. Made from the highest quality stainless steel, it features a lightweight, comfort grip, 0.20 x 50 mm plastic handle that is color-coded for easy gauge identification. With Light Touch Insertion, the needle is easily released from its guide tube by gently pressing the needle away from its point of attachment on the tube. Each needle comes individually packaged with its own polypropylene guide tube, which is rounded on the end for patient comfort and is 100% PVC-free. Box of 100 sterile, light blue tipped disposable needles. 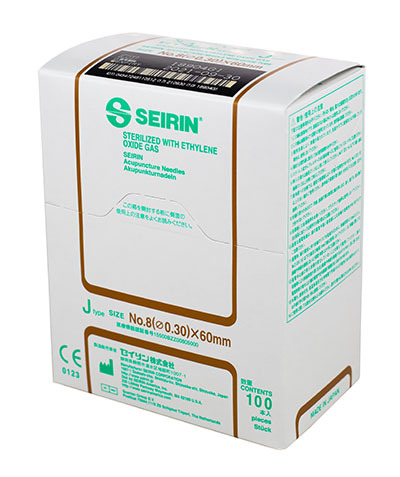 Dimensions: 3.5" x 3.75" x 2"
The SEIRIN® J-Type acupuncture needle produces gentle, painless, and stress-free treatments. Made from the highest quality stainless steel, it features a lightweight, comfort grip, 0.23 x 30 mm plastic handle that is color-coded for easy gauge identification. With Light Touch Insertion, the needle is easily released from its guide tube by gently pressing the needle away from its point of attachment on the tube. Each needle comes individually packaged with its own polypropylene guide tube, which is rounded on the end for patient comfort and is 100% PVC-free. Box of 100 sterile, pink tipped disposable needles. 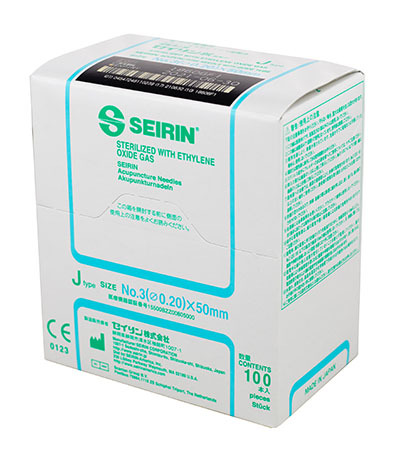 The SEIRIN® J-Type acupuncture needle produces gentle, painless, and stress-free treatments. Made from the highest quality stainless steel, it features a lightweight, comfort grip, 0.23 x 40 mm plastic handle that is color-coded for easy gauge identification. With Light Touch Insertion, the needle is easily released from its guide tube by gently pressing the needle away from its point of attachment on the tube. Each needle comes individually packaged with its own polypropylene guide tube, which is rounded on the end for patient comfort and is 100% PVC-free. Box of 100 sterile, pink tipped disposable needles. The SEIRIN® J-Type acupuncture needle produces gentle, painless, and stress-free treatments. Made from the highest quality stainless steel, it features a lightweight, comfort grip, 0.23 x 50 mm plastic handle that is color-coded for easy gauge identification. With Light Touch Insertion, the needle is easily released from its guide tube by gently pressing the needle away from its point of attachment on the tube. Each needle comes individually packaged with its own polypropylene guide tube, which is rounded on the end for patient comfort and is 100% PVC-free. Box of 100 sterile, pink tipped disposable needles. 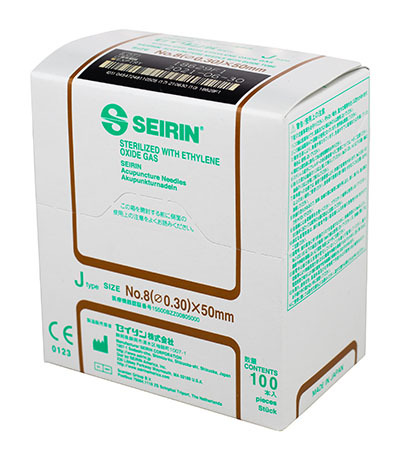 The SEIRIN® J-Type acupuncture needle produces gentle, painless, and stress-free treatments. Made from the highest quality stainless steel, it features a lightweight, comfort grip, 0.25 x 30 mm plastic handle that is color-coded for easy gauge identification. With Light Touch Insertion, the needle is easily released from its guide tube by gently pressing the needle away from its point of attachment on the tube. Each needle comes individually packaged with its own polypropylene guide tube, which is rounded on the end for patient comfort and is 100% PVC-free. Box of 100 sterile, purple tipped disposable needles. 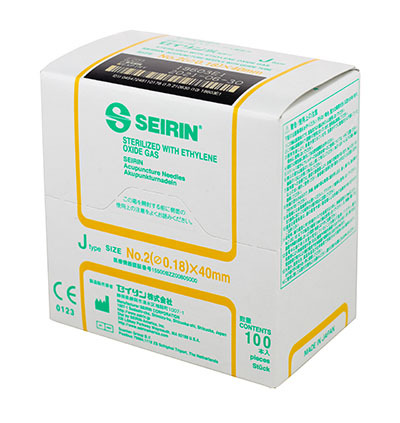 The SEIRIN® J-Type acupuncture needle produces gentle, painless, and stress-free treatments. Made from the highest quality stainless steel, it features a lightweight, comfort grip, 0.25 x 40 mm plastic handle that is color-coded for easy gauge identification. With Light Touch Insertion, the needle is easily released from its guide tube by gently pressing the needle away from its point of attachment on the tube. Each needle comes individually packaged with its own polypropylene guide tube, which is rounded on the end for patient comfort and is 100% PVC-free. Box of 100 sterile, purple tipped disposable needles. The SEIRIN® J-Type acupuncture needle produces gentle, painless, and stress-free treatments. Made from the highest quality stainless steel, it features a lightweight, comfort grip, 0.25 x 50 mm plastic handle that is color-coded for easy gauge identification. With Light Touch Insertion, the needle is easily released from its guide tube by gently pressing the needle away from its point of attachment on the tube. Each needle comes individually packaged with its own polypropylene guide tube, which is rounded on the end for patient comfort and is 100% PVC-free. Box of 100 sterile, purple tipped disposable needles. The SEIRIN® J-Type acupuncture needle produces gentle, painless, and stress-free treatments. Made from the highest quality stainless steel, it features a lightweight, comfort grip, 0.25 x 60 mm plastic handle that is color-coded for easy gauge identification. With Light Touch Insertion, the needle is easily released from its guide tube by gently pressing the needle away from its point of attachment on the tube. Each needle comes individually packaged with its own polypropylene guide tube, which is rounded on the end for patient comfort and is 100% PVC-free. Box of 100 sterile, purple tipped disposable needles. Dimensions: 3.5" x 4.25" x 2"
The SEIRIN® J-Type acupuncture needle produces gentle, painless, and stress-free treatments. Made from the highest quality stainless steel, it features a lightweight, comfort grip, 0.30 x 30 mm plastic handle that is color-coded for easy gauge identification. With Light Touch Insertion, the needle is easily released from its guide tube by gently pressing the needle away from its point of attachment on the tube. Each needle comes individually packaged with its own polypropylene guide tube, which is rounded on the end for patient comfort and is 100% PVC-free. Box of 100 sterile, brown tipped disposable needles. The SEIRIN® J-Type acupuncture needle produces gentle, painless, and stress-free treatments. Made from the highest quality stainless steel, it features a lightweight, comfort grip, 0.30 x 40 mm plastic handle that is color-coded for easy gauge identification. With Light Touch Insertion, the needle is easily released from its guide tube by gently pressing the needle away from its point of attachment on the tube. Each needle comes individually packaged with its own polypropylene guide tube, which is rounded on the end for patient comfort and is 100% PVC-free. Box of 100 sterile, brown tipped disposable needles. The SEIRIN® J-Type acupuncture needle produces gentle, painless, and stress-free treatments. Made from the highest quality stainless steel, it features a lightweight, comfort grip, 0.30 x 50 mm plastic handle that is color-coded for easy gauge identification. With Light Touch Insertion, the needle is easily released from its guide tube by gently pressing the needle away from its point of attachment on the tube. Each needle comes individually packaged with its own polypropylene guide tube, which is rounded on the end for patient comfort and is 100% PVC-free. Box of 100 sterile, brown tipped disposable needles. The SEIRIN® J-Type acupuncture needle produces gentle, painless, and stress-free treatments. Made from the highest quality stainless steel, it features a lightweight, comfort grip, 0.30 x 60 mm plastic handle that is color-coded for easy gauge identification. With Light Touch Insertion, the needle is easily released from its guide tube by gently pressing the needle away from its point of attachment on the tube. Each needle comes individually packaged with its own polypropylene guide tube, which is rounded on the end for patient comfort and is 100% PVC-free. Box of 100 sterile, brown tipped disposable needles. The SEIRIN® J-ProPak® needles are made from the highest quality stainless steel and feature a lightweight, comfort grip, 0.16 x 30 mm plastic handle that is color-coded for easy gauge identification. 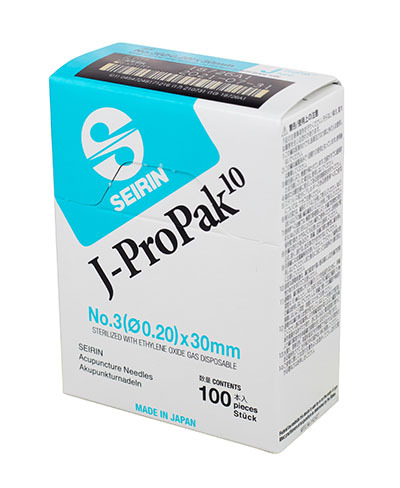 The J-ProPak® features an easy-open multi-pack, that allows for easy access to 10 needles at a time. These user-friendly acupuncture needles are gentle, painless, and stress-free. 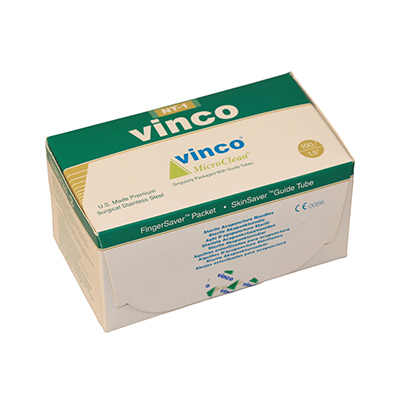 This blister pack also converts into a functional dispenser that can rest on a treatment tray or other surface, keeping the needles sterile and easily accessible during treatment. 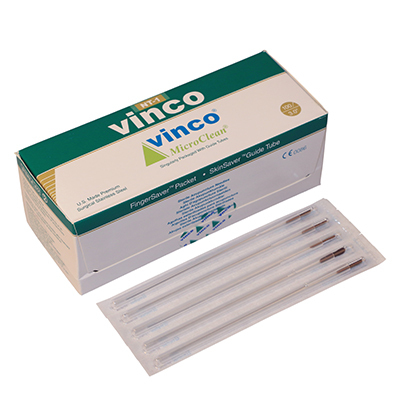 Each blister pack contains 10 plastic handle needles and one polypropylene guide tube. Box of 100. 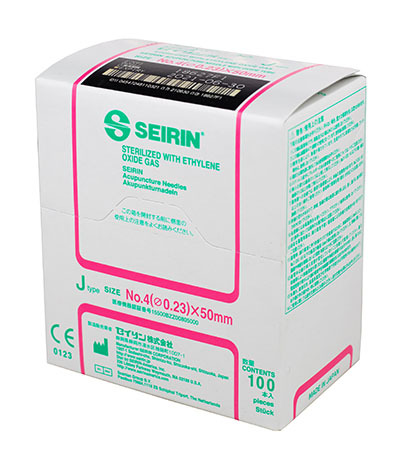 Dimensions: 2.5" x 3.25" x 1"
The SEIRIN® J-ProPak® needles are made from the highest quality stainless steel and feature a lightweight, comfort grip, 0.20 x 30 mm plastic handle that is color-coded for easy gauge identification. 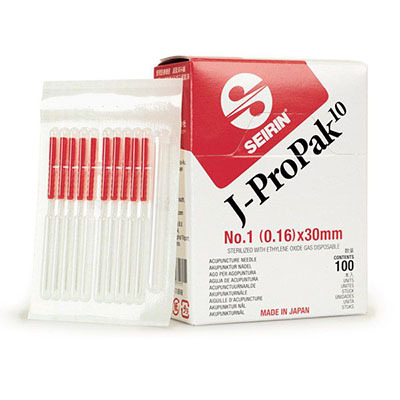 The J-ProPak® features an easy-open multi-pack, that allows for easy access to 10 needles at a time. These user-friendly acupuncture needles are gentle, painless, and stress-free. 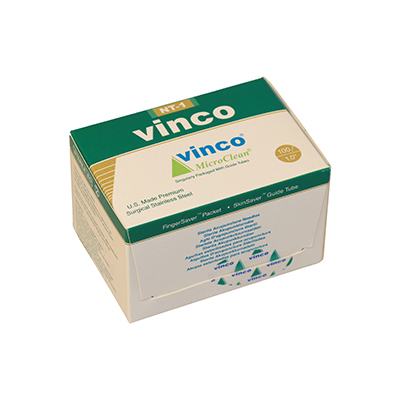 This blister pack also converts into a functional dispenser that can rest on a treatment tray or other surface, keeping the needles sterile and easily accessible during treatment. 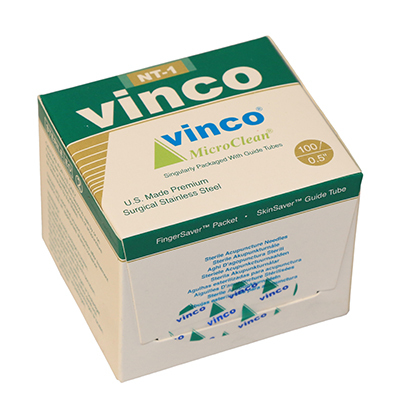 Each blister pack contains 10 plastic handle needles and one polypropylene guide tube. Box of 100.